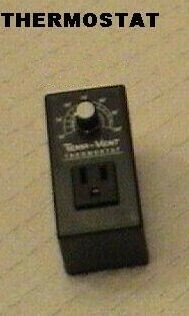 PRODUCT DESCRIPTION: This device is used to turn the POWER VENT on or off depending on the temperature. Basically all you do is dial in the setting you desire and when the temperature reaches that level, the vent will power on. You can also get the HUMIDISTAT controller which does the same thing but controls the vent based on humidity. Either option has a dial for controlling the settings. Both are helpful under many conditions and should be used when running the vent all the time is not needed. These controls can be added by themselves or together and are able to control up to 6 units. 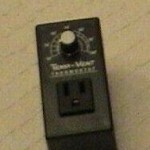 WHERE TO USE IT: Set it in line with the power supply for the vent. RATE OF APPLICATION: This will vary upon your need. If you are able to hook several vents in series than one thermostat or humidistat can be used to power all that are in line. This configuration can be done for up to 6 units whether you use a thermostat or the humidistat.